The Pittsburgh synagogue shooting by a white nationalist underscores the decentralized nature of radicalism in the USA, which is increasingly found on online domains. The comments and influence that the social media site Gab had on the Pittsburgh shooter underscore the potency of some online political communities in catalyzing violence. Further incidents of violence are likely to stem from similar cases of online radicalism, coming in the form for far-right, far-left, and Islamist attacks. Public, private, and third sector organizations are advised to increase their awareness of threats on social media through the use of threat monitoring services. 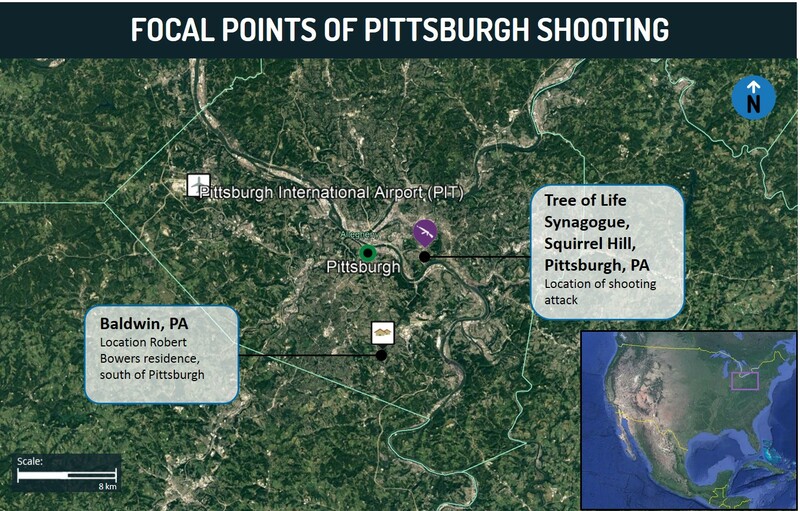 On October 27, 2018, at 09:54 (local time) a white male entered the Tree of Life Synagogue in the Squirrel Hill neighborhood of Pittsburgh, Pennsylvania, 1.6 km east of Carnegie Mellon University and 8 km east of downtown Pittsburgh, with an AR-15-style semi-automatic rifle and at least three handguns. Upon entering the synagogue he was able to discharge his weapons, killing 11 worshippers and wounding six others, including four police officers. The suspect, who was taken into custody following a shootout with security forces, was later found to be Robert Bowers who will be charged with 29 federal criminal counts. While inside the synagogue, which was relatively full due to the Shabbat morning services, the shooter reportedly shouted a number of anti-Semitic statements, including saying to the police while surrendering, “all Jews need to die”. The suspect, Robert Bowers, is a 46-year-old resident of Baldwin, Pennsylvania, a southern suburb of Pittsburgh. He was an active user of the social media platform Gab, where he registered in January under the handle “@onedingo”. His account description read ‘”jews are the children of satan. (John 8:44) — the lord jesus christ is come in the flesh (sic)”’. His cover picture was a photo with the number 1488, which is commonly associated with neo-Nazis and white supremacists. 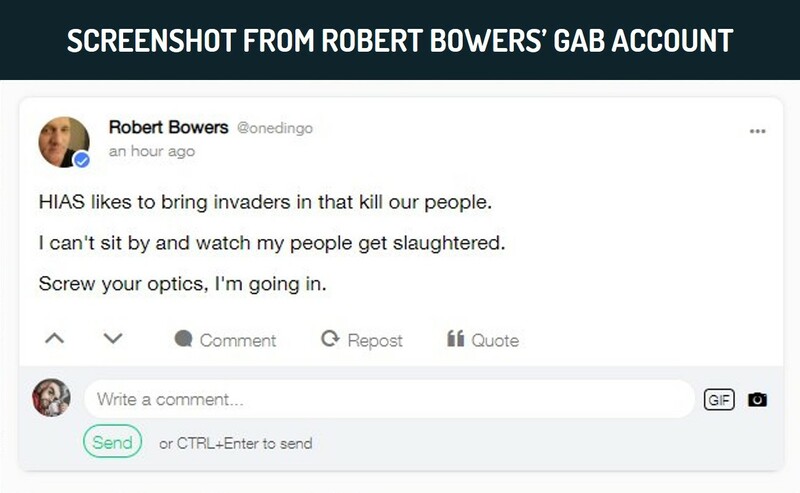 While using the platform Bowers published a number of posts, as well as reposting the content of others, which indicated that he was a believer that white people were being targeted for genocide in the United States and that Jews were responsible. In addition, Bowers criticized President Donald Trump for not being a nationalist and being controlled by Jews. Many of Bowers’ views appear to have surrounded the idea that Jews were catalyzing immigration into the US to the detriment of white citizens. Bowers had no known connections to any organized militant group. The attack on the Pittsburgh synagogue came just two days after the arrest of Cesar Altieri Sayoc Jr., a Florida resident, in connection with a series of letter bombs in the United States which targeted liberal and pro-Democratic public figures. Sayoc was a registered Republican and was reported to be active on social media, where he would often post views deemed “extremist”, particularly with regards to his support for various right-wing policies and anti-liberal messages. Similar to Bowers, Sayoc was believed to have acted alone and had no known connection to any organized militant groups. Of the 14 incidents which were considered “terrorist” attacks in the US between the beginning of 2016 and the end of October 2018, only four had any connection with an organized militant group (in this case, the Islamic State), and these were only claims of allegiance. On three occasions, the Islamic State (IS) or IS-linked media stated that the attack was inspired by them. On one occasion, the claim came from the assailant himself, who stated that he had carried out the attack in the name of the group. Of all the militant incidents that have happened in the US since 2016, none were found to have been specifically planned or conducted by an organized militant group. On the contrary, all of the violent attacks carried out by non-state actors with the intention of catalyzing a climate of fear for political purposes were carried out by unaffiliated individuals. The vast majority of these individuals had been radicalized online, through both regular and social media. The shooting in Pittsburgh, the mail bombs across the USA, and the vast number of IS-inspired incidents in the country and throughout the West, illustrate that the difference between organized militancy and lone-wolf attacks has become increasingly convoluted. While traditionally both governments and the media had differentiated between “terrorism” and lone-wolves, the increase in radicalization online and individuals carrying out attacks on their own volition has shown that militancy has become democratized. Those who carry out attacks no longer need to have any relation to charismatic militant leaders; they can be radicalized online. They no longer need to be in a specific geographical location to find ideologically like-minded extremists; they can be recruited to carry out attacks through social media. These individuals also no longer need large networks of criminal and militant connections to acquire attacking expertise or equipment; they can research and purchase such materials via the internet. Moreover, it has become ineffective, in many cases, to organize a militant group in a single location, where police are more likely to be alerted to activities. It is more effective to gain influence in online spaces, encouraging radical ideas and calling for attacks, which will then catalyze the individual’s motivation to carry out a shooting, stabbing, or vehicular ramming. In many cases, targeted individuals may have pre-existing issues with mental health, potentially making them more susceptible to radicalization. 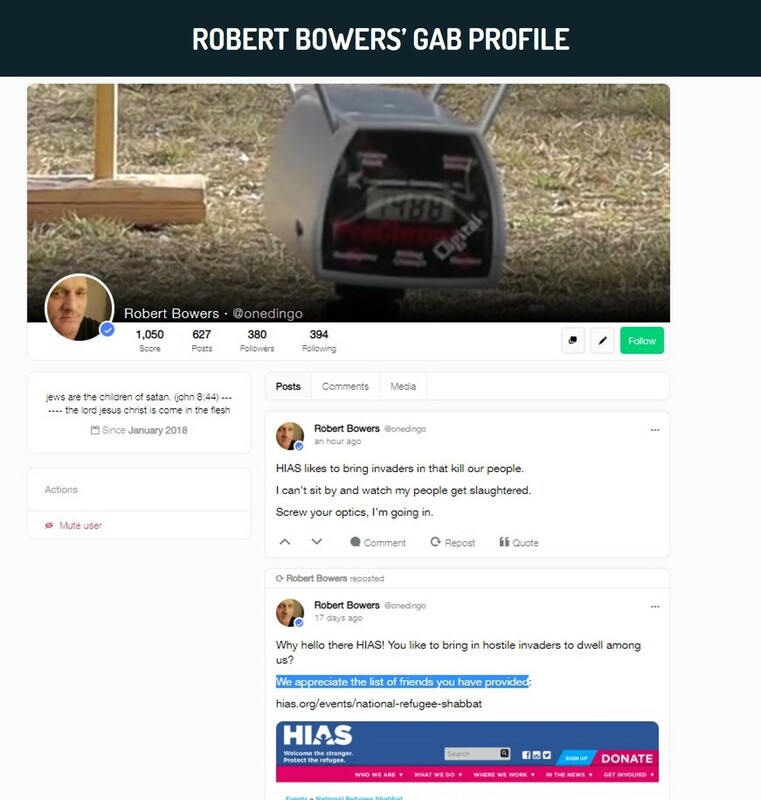 Such was the case with Robert Bowers, who was not known to have any militant links but had engaged with extremist, anti-immigrant, and anti-Semitic rhetoric on the Gab social media platform, which likely exacerbated pre-existing views. He did not appear to have been encouraged by any politically-motivated central organization to choose his target or carry out the attack; the shooting was entirely of his own doing. Nonetheless, there are also political ideologies within the US which will benefit or use the shooting to further their extremist views, with far-right users online praising Bowers and conspiracy theorists arguing that the attack was a “false flag” intended to cast a negative light on pro-white ideologies. The use of websites such as Gab and the encrypted messaging network, Telegram, has become a base for a number of radical and pro-militancy groups, both far-right and jihadist. Through such social media websites, they have found a unique platform with which to discuss their ideologies, unchallenged and unaffected with the outside world; an environment which breeds radicalism due to the continued validation of their beliefs. While such platforms do not, themselves, encourage militancy, they are preferred by more extremist groups due to the premium that they place on privacy, particularly from government oversight, and on free speech, with both platforms being preferred by covert and fringe groups. FORECAST: Further cases of radicalization and militancy being planned, announced, or inspired on such websites will continue going forward, with this framework for attacks likely becoming among the most common in the West. This will particularly be the case in the US which is increasingly experiencing a climate of political violence and lone-wolf attacks. With an understanding of militancy which moves away from a structured organization of fighters to a loose ideology which can recruit individuals across the world, comes new problems with regards to counter-militancy. Attempts to mitigate and stop attacks before they arise can no longer rely on methods of surveillance and infiltration of small cells while attempting to neutralize leaders. Rather, it is necessary that governments and private institutions take a more active role in analyzing such social media platforms for general trends with regards to possible targets, methods, and attacker profiles. Ideological and “meme” trends on such platforms can give indications of tendencies, while deep and dark web infiltration can allow for greater access to information on possible attacks. For example, the comments from Bowers in which he ends with “Screw your optics, I’m going in.” – indicated an imminent attack and could have been found, through online monitoring, prior to the incident to aid with mitigation attempts. It is evident from both the Pittsburgh shooting and, perhaps more pertinently, from the mail bomber, that, unlike with IS attacks, the targets of this decentralized paradigm of militancy are not necessarily random. In fact, in both cases, they were highly specific. In the case of the Pittsburgh attack, it was the local Jewish community and in the case of the mail bomber, it was a number of prominent pro-Democrat individuals, including private businesses. With this in mind, global corporations and prominent individuals or institutions are liable to be targeted by such militants due to their political stance on various issues, and the interest in such targets can be tracked online. Unless serious investigations into the perceptions of a company’s political footprint are uncovered, it is far harder to understand whether or not there is a threat from extremist groups. It is important to gather whether or not a company is linked, or perceived to be linked, to an issue which is on the radar of online radicals, so appropriate steps can be taking towards securing the firm’s employees, assessments, and reputation. Through a campaign of online social media, deep and dark web brand monitoring, companies are able to identify threats or sentiments which could result in violence prior to attacks. Unlike with militant groups who speak in highly clandestine circles, modern social media radicalism is relatively easy to survey and track. Private companies and individuals possess the abilities to monitor the perceptions of their brand from a security standpoint, to ensure they are not becoming the focus of political or Islamist radicals. Public, private, and third sector organizations are advised to increase their awareness of threats on social media through the use of threat monitoring services. Increased awareness of an organization’s political footprint and perceptions from fringe online groups can help uncover potential violent actors and plots before they occur. Hey Buddy!, I found this information for you: "Pittsburgh Shooting – How Social Media became a Platform for Decentralized Radicalism and Political Violence – USA Special Analysis Report". Here is the website link: https://www.max-security.com/security-blog/pittsburgh-shooting-usa-special-analysis-report/. Thank you.